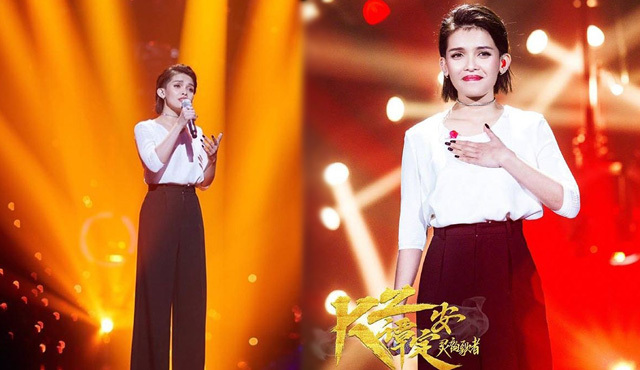 After her spectacular performance last week with her own rendition of Adele’s “Rolling In The Deep”, KZ showcased her versatility this time when she performed a medley of Chinese songs “ what else do you want from me?” by Joker Xue and “all the things you never knew” by Wang Lee Hom. She then revealed that she heard these songs by accident but fell in love with it. The soul supreme was also asked why she will present Mandarin songs, she said that it is her way of respect for China. Despite learning the songs in less than 2 weeks, the 25 year old singer still delivered a powerful yet moving interpretation. In the conclusion of the show, she was ranked 6th out of 8 contenders however, Tandingan is still on the next round of the competition as her placing from her 1st performance and this week combine help her to avoid the elimination. The format of the show is for the contestant to have an average ranking not below 4th place from their 2 performances. It means that KZ’s overall average is enough to become a regular contestant in “Singer 2018”. The X- Factor alumna is now aiming to be a part of live finale happening on April 13. She may have performed on an international stage now, but one thing that will not change is the enormous support of her family; her dad Tex, her mom Marites and 2 siblings Irmo and Beauty. After her journey on X factor last 2012, KZ is again joining on another contest 6 years later with fellow singers in China’s current no. 1 show. She became teary eyed when her audition clip from her previous contest was showed to her during a press conference. The Cornerstone artist is then overwhelmed with emotions with the cheering she received from her family. They are currently living on Digos, Davao Del Sur where their work and education is based there. Despite the longing, KZ makes sure that they are communicating every day.